Welcome to CoMo Game Jam V! For those of you new to the experience, thank you for coming! For those of you who've been with us before, welcome back! We're kicking off our 5th CoMo Game Jam, and we're excited to have you all! 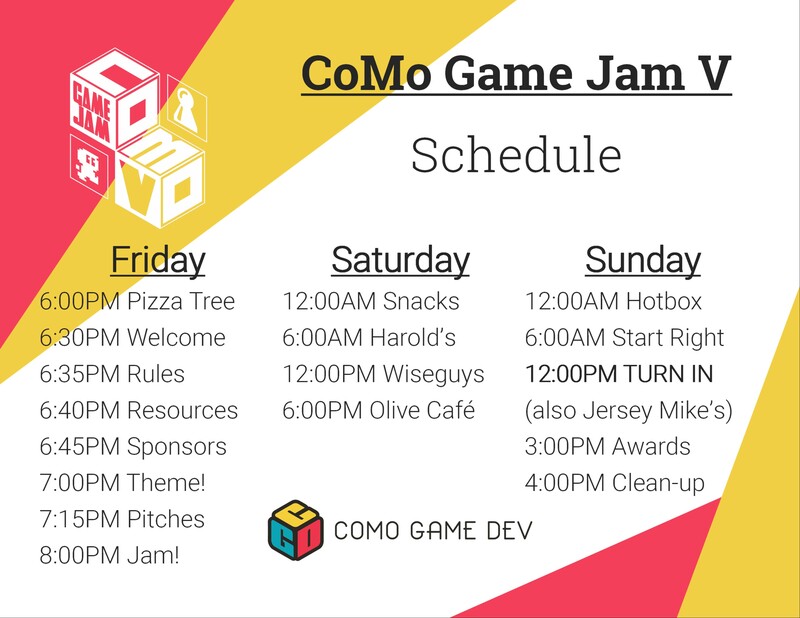 This Game Jam is run by the CoMo Game Dev Association! Look for our distinctive shirts throughout the game jam to get help when you need it, how you need it. We want to make sure you have a good experience and come out with something you're proud of, so don't be afraid to ask for help! We'll be wearing very distinctive shirts - as well as announce when the food arrives - so feel free to flag us down! We'll be starting off just like our previous game jam, with food and mingling before the theme is announced. Fri 6:00 PM - Food and participants arrive. Get your shirt and name tag. Forced awkwardness all around. Talk to people! Everyone there likes games, so there's an instant ice breaker! Fri 6:30 PM - Intro by CoMo Game Dev Association and a rundown of the rules (listed below). Fri 6:45 PM - Thank the Sponsors of this amazing event! Fri 7:00 PM - "Hail Game Jam, they who are about to box salute you!" Lunch Boxers will be used to choose a theme grand melee style. Fri 7:30 PM - Game pitches! If you have an idea, get up and pitch it! It doesn't have to be complete or well developed, it just has to sound like fun. Get up, give your name, the game's name, and the general idea. Fri 8:00 PM - Teams are formed and the fun begins! Anyone new to game jams, or just want some extra pointers, can stick around and hear a brief 5 minute primer from a Video Game Jammer and a Tabletop Jammer on best practices. Sun 10:00 AM - Start getting your games uploaded. Mentors can help with this process. Sun 12:00 PM - PENCILS DOWN GAMES MUST BE IN. Lunch is served. Sun 3:00 PM - (Hopefully on time!) Winners announced! Your game must use the theme in some way! Video Games - Any art assets, code bases, sounds, etc. Extenuating circumstances may be allowed on a case by case basis, e.g. 3D printers should not be transported, VR setup is mounted to walls, etc. Everyone here is wanting to have a good time and make something awesome. Being antagonistic or going out of your way to ruin someone's time won't be tolerated. Being competitive is fine; being an a-hole isn't. Help! I'm at a Game Jam! First off, Join our Discord! Everyone at the game jam should make sure and join the Discord to keep up with announcements throughout the event. We will be using this to announce food, show streams, remind you to submit, and much more! Along with this, we have provided you with some quick links and tips on how to make the most from your first (or second, or third, or...) game jam! Is it real, or an illusion? Alt+F4 to exit. You awoke in a field, is this real? Is anything real? The world around you keeps changing. What is happening? Guide your minion through dangerous levels to get to his friend.